I hope that as you travel through this website you will find a reflection of our vibrant and diverse community. Set on 456 acres in the peaceful town of Byfield, The Governor’s Academy offers a remarkable balance of options and opportunities for the young men and women who choose our school. The oldest of the New England boarding schools- established in 1763- The Governor’s Academy embraces both time-tested tradition and 21st century innovation in its approach to education. On your visit you will see the original schoolhouse and a stunningly modern library, a school seal developed by Paul Revere and a state-of-the-art, lab-centered science building, and a campus buffered by salt marshes (used extensively in our marine biology class) and complete with a brand new girls’ dormitory, hockey rink and turf field. While this website is remarkably rich with respect to content, it cannot fully reflect the energized atmosphere here at The Governor's Academy. To appreciate the blend of focused effort and infectious fun that is unique to our school requires a visit to our campus. 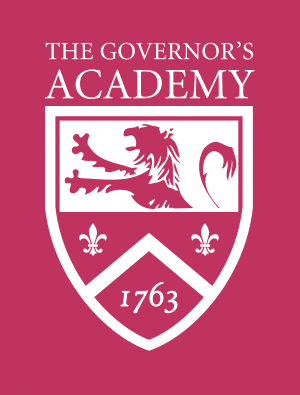 Please begin the process of applying to The Governor’s Academy by exploring the links to the left. The Governor's Academy does not discriminate on the basis of race, religion, gender, sexual orientation or national or ethnic origin. Our school is committed to helping deserving students have the opportunity to attend regardless of financial circumstances. More than a quarter of our students receive financial aid. I look forward to seeing you on The Governor's Academy's campus, and I am certain that you will share my enthusiasm for this dynamic and balanced school.